For many of us college-aged triathletes, we’ve either decided to specialize in one of the three disciplines of our beloved sport, focus on another (like crew) or join our school’s club triathlon team. It seems unthinkable that the option to pursue triathlon as a viable NCAA option in college could be possible. Or not anymore SOON, that is. A feature on the NCAA website [read it here] indicates that triathlon is poised to be the next emerging sport for women. For all you male triathlon enthusiasts… don’t hold your breath. It may be a few more years or more after even women’s triathlon becomes official that you see NCAA recognition for your side of the sport. Angry? Take it out on Title nine. But hey, be positive… right? Now there’s a chance there might be more triathletes on your campus! More training buddies? 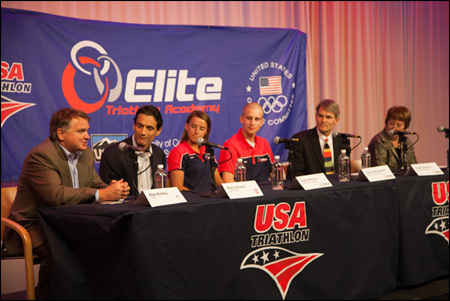 The recognition of triathlon as an NCAA sport has the power to change triathlon forever. For, as of now, many YoungTri members as well as other triathletes have chosen to put off training during the year to compete in other sports at the NCAA level. Patrick LaBrode, YoungTri Executive Board member, struggled with the decision of whether to train for triathlons in college or swim. He’s now a D1 swimmer at the University of Texas, and says he couldn’t be happier. He’s excelling in the sport. Besides going the traditional swim, bike, or run route, more and more triathletes are trying their hand at the rowing world in college. I speak from firsthand experience… I was recruited from triathlons to row in college. Andrew Gyenis, another YoungTri member, is now rowing at Stanford and is thrilled with his decision. The question still remains, however, how the possibility of triathlon as an NCAA sport would affect the college choices of potential college triathletes. Would athletes used to switching between cross country and swimming during the year be committed to doing triathlons year round? In other situations, would athletes be willing to race at one of the few schools that may offer triathlon as an NCAA sport instead of pursuing swimming, cross country, crew or otherwise? This is a question that can only be answered at the time of the sport’s true entry into the NCAA. Right now, the six schools in support (letter writers) of triathlon as an NCAA sport are Adams State, Air Force, Arizona, Colorado-Colorado Springs (the school established the Elite Triathlon Academy in 2011), Marymount (Virginia), and Monmounth. With Navy’s intent to also sign on, three other schools would be necessary to begin the process of securing triathlon’s NCAA status by the deadline of June 1, 2013. If this NCAA emergence takes place, it will be interesting to see how it alters the collegiate national championship (for it would be an NCAA race rather than just a USAT race) and whether schools with already prominent club triathlon teams like Stanford, Duke, UNC, UVM, Cal and others would sign on or keep their club designation. An NCAA designation for triathlon could do the sport a great deal of good. Increased awareness, participation, enthusiasm, and scholarship opportunities can only lead to better athletes – which could eventually lead to a strengthened U.S. Olympic team. If you’re interested in pursuing triathlon as an NCAA sport if the opportunity presents itself, I encourage you to read the NCAA article linked above and stay in touch with current happenings. And if you’re already a college athlete? Hey, don’t fret. The great thing about triathlon is that it’s a sport for a lifetime (you know you want to be that 80 year old doing Ironmans…) – taking four years off (or being a LITTLE less intense year-round) won’t kill you ;).